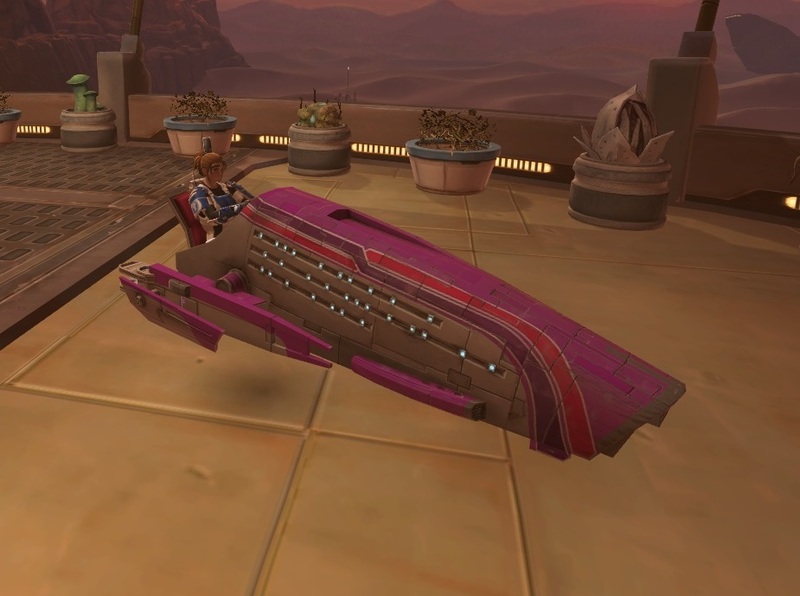 Going Commando | A SWTOR Fan Blog: Community Cantina Speeders! If you want one of your own, feel free to click this link! They've changed it so that these can be shared up to fifty times per person, so there shouldn't be a shortage. All you need is a SWTOR account, and you will then get a box containing the pictured speeder in the mail on all of your characters. The box also contains another random goodie - for me it's usually an ugly dye, but potentially it can also be a cool stronghold decoration. After claiming the unlock through the link, you'll also find a link of your own in your account management, through which you can pass the goodness on to another fifty people. Share the love! I also got the infamous pink speeder from the Anaheim cantina a couple of months ago, which could "only" be shared five times. 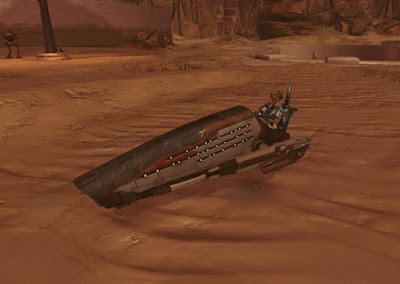 I sent my link to one or two people in private, planning to "save up" the rest of my "charges" so I could one day in the far future surprise someone with a now rare speeder. Well, Bioware sure foiled that plan, because apparently the codes expire! I know that it wasn't used up since I never posted it anywhere, but nonetheless my account page says that it's no good anymore now. Something to keep in mind - and the reason I decided to share this new code right away so that as many people as possible would benefit from it. I'm guessing that this one will also expire once the next community cantina code gets released. * Sorry, re-reading the Hitchhiker's Guide to the Galaxy at the moment. Just saw about this on Larry's post on Massively but the website is down, typical! Of course! ;) It's back up again now though. Maybe it was overloaded by speeder claimants! I had no idea they could be shared 50 times now, thanks for letting me know! Btw, for the previous speeder it did say on your account page on the parts where the codes were that they were going to expire 60 days after the event. Still a bit cryptic because it didn't say an exact day, but I just looked up when the event was and counted from there for the speeder giveaway that I did. Well spotted! I guess that's what I get for not reading the small print, though I'm pretty sure I wasn't the only one. I keep expecting those speeders to be saying "pew pew pew!" Sweet! Just snagged that speeder :D It's sorta ugly, but I'm sort into ugly speeders. Is it just me, or does it vaguely resemble the Mass Effect ship Normandy's nose? Thanks for the code! Got the speeder plus a Gonk droid pet on my Bounty Hunter.